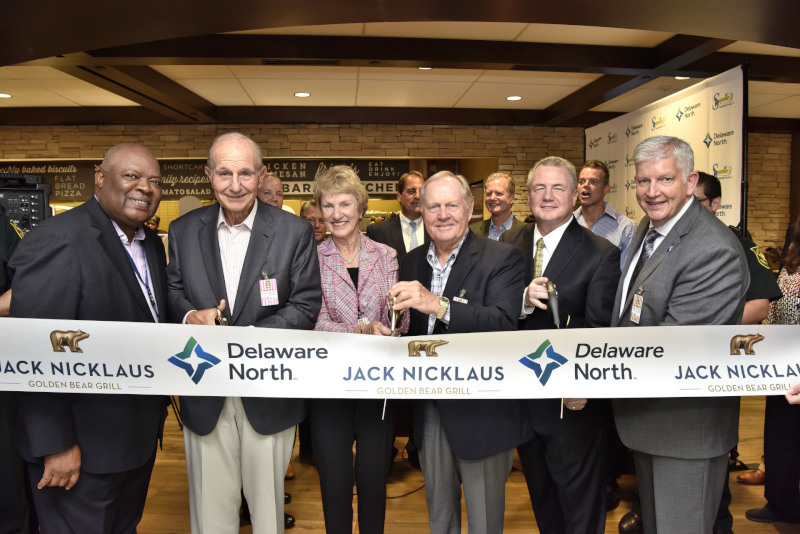 Jack and Barbara Nicklaus cut the Jack Nicklaus Golden Bear Grill ribbon with Jeremy Jacobs, Chairman of Delaware North Companies, and representatives from Delaware North and Fort Lauderdale. Today, golf legend Jack Nicklaus and his wife Barbara, alongside representatives from Delaware North — a leader in food service management — officially opened the Nicklaus family’s first branded restaurant, the Jack Nicklaus Golden Bear Grill, at Fort Lauderdale-Hollywood International Airport in Terminal 3. The 2,800-square-foot restaurant, which seats up to 100 people, features memorabilia and family photos hand-picked by Jack and Barbara to connect customers to the storied legacy of golf history’s greatest champion, ambassador, course designer and philanthropist. But while the Golden Bear Grill certainly celebrates the game of golf, it also celebrates the life and lifestyle that surrounds the game. Barbara worked closely with Delaware North to design the warm, inviting and comfortable interiors. Meanwhile, a team of chefs serves up comfort food, with many of the recipes featured coming from Barbara and her daughter Nan’s cookbook, “Well Done!” Items including “Jack’s Favorite Greens,” a salad with romaine and iceberg lettuce, gorgonzola, red onion and smoked bacon; meatloaf; chicken parmesan; and “Buckeyes,” a chocolate peanut butter treat paying homage to Jack and Barbara’s home state of Ohio, are some of the featured items straight from the Nicklaus family’s kitchen. The Jacobs and Nicklaus families have a long history, and according to Jack, bringing this personal relationship into a business partnership was a natural fit. “You might say I am a food aficionado—which, translated, means I like food quite a lot — and Delaware North is a leader across the country in delivering great dining experiences, so partnering with them made sense,” said Nicklaus, who was among the pioneering athletes to leverage his success and name to create a brand. “Delaware North is well-respected in the business and they’ve done a great job everywhere they’ve been. Golden Bear Lemonade by AriZona Beverages was our first foray into food and beverage in April 2012. We also introduced wine through our partners at Terlato. And most recently, we teamed up with The Schwan Food Company to launch Jack Nicklaus Ice Cream. The restaurant complements the Nicklaus Companies’ portfolio of licensed products — especially those in food and beverage. And it also furthers their mission to tie in charity. There are a number of Nicklaus-branded products that have a charitable tie-in, including: Nicklaus Golf Balls; Jack Nicklaus Wine by Terlato Wines; AquaHydrate water; Golden Bear Lemonade by AriZona, and Jack Nicklaus Ice Cream. Most of the products mentioned are available in the restaurant and each gives back to charity. The Golden Bear Grill is no exception, as consumers have the option to add a donation to the Nicklaus Children’s Hospital with every check. The restaurant welcomed its first visitors with a soft opening on June 24, and according to restaurant and Delaware North officials, has far exceeded projections and expectations. Today, however, Jack and Barbara Nicklaus had their first look at the concept turned reality—three years in the making. A second Golden Bear Grill is slated to open at Charleston International Airport in South Carolina in September.